A cautionary tale about the dangers of believing yourself to be beyond reproach. 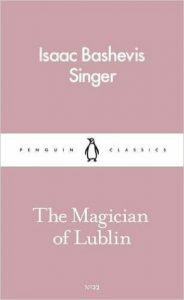 The Magician of Lublin is an interesting blend of timeless interactions across class divides and a time-capsule-esque setting of Jewish ‘shtetls’ in late 19th centuary Poland. Yasha, the unlikeable, selfish, womanising, ‘hero’ of this tale is one of the most frustrating and vivid characters I have come across in a while. He practically leaps off the page with his self-importance and his completely contradictory love for his wife and obsession with one of his (many) mistresses. He lives a life of sin and vice, as a traveling magician. He has achieved some renown in Poland, but he dreams of ‘making it’ on a bigger, grander, stage in Italy or beyond. This being a bleak story things almost immediately begin to go wrong, and the story charts Yasha’s rather spectacular fall. Yasha beings the story with boundless confidence. He is balancing a mistress in each town, a pious Jewish wife at home, and sleeping with his assistant, and appears to be keeping everyone relatively happy – and separate. He is shown to be a master flatterer and manipulator, playing everyone perfectly and with ease. But the cracks begin to show in his godless life, and his abandoned Jewish faith keeps tugging at him, most strongly in the moments when he promises to revoke it forever. His utter lonliness also becomes apparent, as there is nothing like lies to put a barrier between two people. Yasha carries so many lies with him that it is impossible for him to form meaningful connections with anyone at all and he suffers for that most of all. I loved how bleak this book is. Yasha gets very little in the way of redemption despite his suffering. But in a way a happy story just wouldn’t have suited this character, he was a culmination of twisted sin and suffered the consequences. The beautifully realised setting helped to bring this story to life, I felt immersed in the Polish countryside and the chaotic streets of Warsaw. Though this book was not the rollicking tale about a stage performer I was expecting it was something far more satisfying.